Featured ice artists come from diverse backgrounds with different levels of experience and expertise. 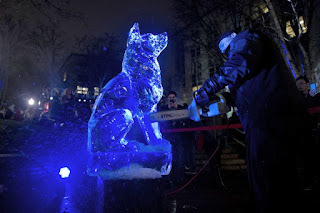 A number of them have participated in all of the festivals, including professional ice carver Joe Almeida plus Don Chapelle, founder of Boston’s “Brilliant Ice Sculpture,” who always creates a unique, and often interactive, piece in front of Thornes Marketplace. Work by master ice artist Eric Fontecchio will once again grace the terrace of the Eastside Grill. A late addition to the group is professional ice carver Billy Poe who will be working in front of Eileen Fisher at 24 Pleasant Street, just around the corner from Florence Bank where Peter Dellert makes a fifth appearance this year. Versatile sculptor Matt Evald Johnson returns as does wood carver Nathan Peterson. The eclectic Maggie Nowinski debuts along with Florence painter Rob Kimmel. A map of artists and their installation sites (see list below) is online at www.nohoarts.org and at many Arts Night Out locations. Additional maps are available during the event. * Late addition. Not included on map.